New Delhi: Infrastructure companies that rely heavily on debt to fund their projects are struggling to raise money as the global financial crisis and a slowing domestic economy force borrowing costs up and make lenders increasingly risk-averse, a combination that could result in less aggressive price bidding for public works contracts. The worst hit are small—and comparatively less viable—infrastructure projects that had already been weighed down by soaring prices of commodities such as steel and cement over the past year. Domestic borrowing costs have increased sharply after the central bank in July raised its benchmark interest rate to a seven-year high to fight inflation. “We are taking a hit both on cost of financing and on cost of inputs," said Ankineedu Maganti, a director at Soma Enterprise Ltd, which builds highways and hydroelectric projects. 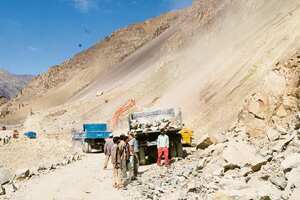 Soma is negotiating debt to finance a 291km road project, estimated to cost more than Rs2,000 crore, that it won this January. While input cost increases would be covered by wholesale price index-linked increases in tolls and user charges, the company is taking a hit because of the rising cost of debt servicing, Maganti said. To cover this, Soma may raise its equity internal rate of return, or IRR, from 15% to 18-21% depending on the project, Maganti said. Equity IRR is a budgeting device that allows firms to decide on the quality of an investment, expressed as the annualized rate of return on an equity investment. Fewer aggressive bids could be the outcome of the increased cost of finance and expenditure on project inputs, said Amrit Pandurangi, who heads the transport and infrastructure practise for consulting firm PricewaterhouseCoopers. Bids for many national highways, particularly ones that were already collecting tolls, have been aggressive in the recent past. A tender for five stretches of national highways earlier this year drew 42 bidders. Partners Emirates Trading Agency and KMC Construction Ltd offered to share as much as 38% of the revenue generated from the Gurgaon-Jaipur highway with the government. The revenue share percentage, the basis for selecting the winning bidder, increases by one percentage point every year, as the cost of servicing loans for the concessionaire decreases. As domestic economic growth slows, some companies are scaling down revenue projections, raising questions over their ability to service debt. The economy grew 7.9% in the three months ended 30 June, down from 8.8% in the previous quarter. Construction growth slowed to 11.4% from 12.6%. “Thanks to the general slowdown, traffic growth will have to be re-examined," said Pandurangi. “In aviation, 20-25% growth has suddenly vanished. Similarly is the case in ports sector, too, which is dependent on the growth of imports and exports. A year ago, PE (private equity) funds were happily buying at any price. Then input costs of steel and cement went up and they baulked. Now, there is a likely reduction in growth," Padurangi said. “From all angles—be it general capacity to execute projects, capability to finance projects or the government’s bidding process—it clearly looks like (a) slowdown," said Pandurangi. The infrastructure sector typically works on a 7:3 debt-equity ratio with companies borrowing Rs7 for every Rs3 in equity investments. Banks typically lend to infrastructure projects at close to the so-called prime lending rate—the rate they charge their best customers—or the benchmark lending rate. And these rates have increased from 12.25-12.75% to 13.25-14% over the past five months alone. The cost of financing “is something that is looming large right now, but the real question is the underlying viability of the project", said Sachin Mathur, who heads the research team for ratings firm Standard and Poor’s Indian arm Crisil Ltd. While debt fund flows from western economies may decrease, domestic banks are not looking to limit investments just as yet. Infrastructure will continue to be attractive for banks compared with other lending, said Mathur. Currently, except for the power and airport sectors, domestic banks fund most infrastructure debt requirements in the country and will continue to be the main source of funds for some time, said Arun Kaul, chief general manager at Punjab National Bank. Banks’ exposure to the infrastructure sector was estimated to have increased 41.7% this year to Rs2.03 trillion as at the end of May. But, wary of lending in the current economic environment, banks may subject projects to greater scrutiny. “New projects will be looked at selectively (by banks)," said Arvind Mahajan, executive director at consulting firm KPMG Advisory Services Pvt Ltd.